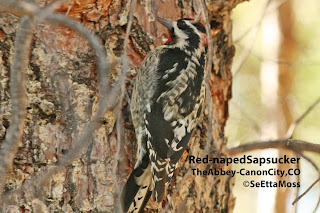 I had spotted a female Williamson's Sapsucker at Lakeside Cemetery in Canon City, CO last week. This is another location where sapsuckers have wintered in most years. However, I wasn't sure if this female might be the same one that I had found at Centennial Park, which is about a mile from this location (at least as the crow/sapsucker flies) as I have found in previous years that sapsuckers work in areas this far apart. I spotted a sapsucker flying but quickly realized it was a male Williamson's. Soon after I was very surprised to find that there were two male Williamson's Sapsuckers not only working the pine trees in this cemetery but seeming to chase each other from tree to tree then feed only a few feet apart without apparent antagonism--that seems most unusual. 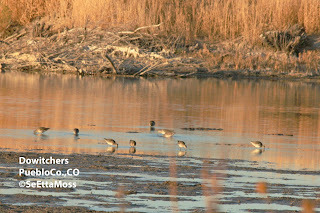 I also found this small flock of Dowitchers feeding in an irrigation pond in Pueblo County yesterday. I believe these are most likely Long-billed Dowitchers but they didn't give any calls, the best way to separate them from Short-billed Dowitchers. Plus they were quite distant and the light dwindling as it was almost dusk so I was not able to make out the field marks necessary for an accurate identification. It is getting a little late for even Long-billed Dowitchers to be migrating through Colorado and some/all of these may be juveniles. 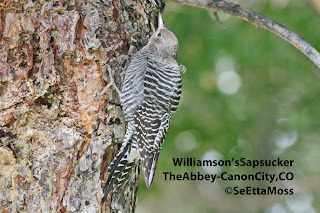 I was able to get a little better pic, albeit a back view, of this Williamson's Sapsucker, that I have added as the top pic. I found this male Red-naped Sapsucker yesterday, also on the grounds of the Abbey in Canon City,CO. Red-naped Sapsuckers have occasionally wintered in Canon City. 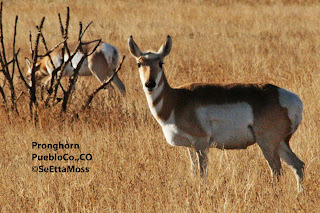 They are also a species that is known to migrate south, even further south than Williamson's, to winter in south New Mexico and West Texas as well as Mexico. 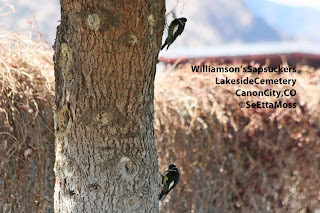 Canon City, CO has hosted wintering sapsuckers every year for the past 7 years when I found the first one, also a Williamson's, on the grounds of the Abbey (a former monastery and Catholic boarding school with a large campus that has hundreds of trees of diverse species). 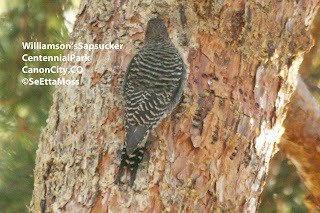 I found the female Williamson's Sapsucker in these photos a week ago in the same location on the Abbey grounds as most of the sapsuckers that have previously wintered in Canon City. Williamson's Sapsuckers generally migrate south to winter in New Mexico and down into Mexico.